In a season where the main storyline has been the offense, Zach Eflin pieced together his second solid outing of the season on Sunday as the Phillies defeated the Twins at Citizens Bank Park, 2-1. The win secured a series victory for the Phils and improved their record to open the season to 6-2. "I think today was a really important day for the direction of our baseball club," said Phillies manager Gabe Kapler. "Specifically because I think we proved that we don't have to just see a lot of pitches and score a lot of runs with a very potent lineup to win a baseball game." Rhys Hoskins delivered the lone offensive highlight for the Phillies with a two-run homer off Jose Berrios in the sixth. It capped off a two-out nine-pitch at-bat. Andrew McCutchen reached base earlier in the frame on a walk, then moved over to third on a Bryce Harper ground out as third base was uncovered. "Going to third base after that walk was enormous," Kapler said. "Berrios could not throw a ball in the dirt at that point and Rhys was able to get a pitch he was able to hit out of the park because McCutchen was standing on third base." "We're a stubborn bunch," Hoskins said. "We stuck with the plan and eventually got something to hit." Berrios was impressive for Minnesota, tossing six innings while surrendering just two hits - one being the Hoskins homer. He struck out seven. "He's one of the better young starting pitchers that we've seen at Citizens Bank Park, at least since I've been here," Kapler said. As for the Twins offense, Max Kepler delivered a solo shot to lead off the contest, but that was all the damage they could do to Eflin who surrendered six hits and struck out five over seven innings. In two starts this season, Eflin has surrendered just one run over 12 innings on nine hits. He's also walked just one batter while collecting 14 strikeouts. It's a solid beginning for a hurler expected to make big strides in his progression this year. "The action on my sinker and my change-up, I think they were working really well today," Eflin said. "I didn't really have my best slider, so it was nice to have another pitch I could use and that was beneficial." Kapler had action in the bullpen entering the seventh inning with Eflin approaching 100 pitches, but he opted to instead exercise confidence in his hurler and it paid off. 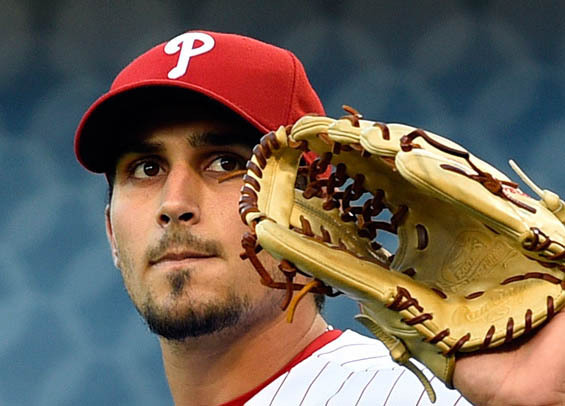 "It was nice, it's what I've been wanting my whole career," Eflin said. "To be able to go as long as I can, especially when your at six innings with 90-plus pitches. For [Kapler] to have that confidence in me, it's huge." "No, it was going to have to happen one of these days. It's just nice it happened during the second outing of the year," he said. David Robertson and Adam Morgan combined to toss a scoreless eighth for the Phils and Hector Neris tossed a perfect ninth to notch the save. "Neris got behind 3-1 to [Marwin] Gonzalez and never gave in, kept delivering good split after good split, and then was able to get through some tough hitters," Kapler said. Maikel Franco collected his 500th career hit with a double in the seventh ... Bryce Harper has reached base safely in each of the Phillies' eight games this season. He worked a pair of walks in Sunday's win ... The Phillies have gone undefeated in their first three series to open the season for the first time since 2011 ... Hector Neris has struck out 47 of the last 105 batters he has faced dating back to June 17, 2018. Vince Velasquez will make his first start of the season on Monday as the Phillies welcome the Nationals to Citizens Bank Park for a three-game set. Anibal Sanchez is set to start the series opener for the Nats.